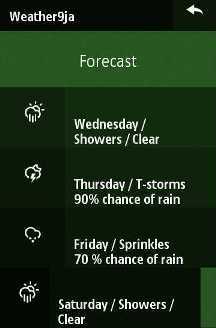 Wondering what the weather in your city in Nigeria will be like today or tomorrow? Well, you can simply get that information on your phone using a brand new mobile website dedicated to providing you with the latest weather information on all major cities in Nigeria. 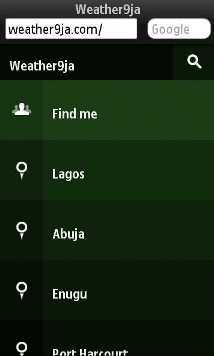 The new mobile website at weather9ja.com offers you the weather conditions right now in major cities in Nigeria and Africa as well as a 4 day weather forecast for those cities. 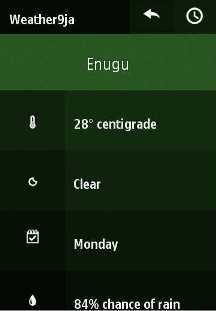 Weather9ja also has a feature that automatically finds your location and display the weather conditions, though this feature seems not to work with every device. Don’t get caught out in the rain, point your browser to weather9ja and find out what the weather has in stock. Click on your city or simply search for it for a display of current weather condition (the temperature, cloud condition, chances of rain). You also get temperature and weather conditions for some times of the day (8am, 12pm, 2pm, 6pm, 10pm). To get the 4-day weather forecast for the city, click on the clock symbol. 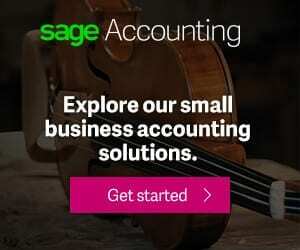 weather9ja.com can be accessed on any browser on mobile devices and on your computer, though it looks a lot better on mobile phones. Cities currently represented on weather9ja include Lagos, Abuja, Enugu, Port Harcourt, Kano, Katsina, Nsukka, Ikoyi, Calabar, Abeokuta, Ibadan, Ilorin, Jos, Zaria, Minna, Benin, Sokoto, Osogbo, Yola, Kaduna, and Jalingo. Other cities with one click weather access include Ife, Owerri, Zamfara, Bauchi, Makurdi, Asaba, Kebbi, Kogi, Dutse, and Abakiliki. weather9ja is a useful little app that everyone needs, whether you are using a feature phone, smartphone, tablet, PC, or Mac, ignorance of the weather is no longer an excuse. However, it remains to be seen how accurate the weather info and forecast will be over time. Also with the harmattern at hand, visibility is probably a crucial weather information that weather9ja should be supporting in future.